To Cite: Arzi A, Hemmati A A, Sistani Karampour N, Nazari Khorasgani Z. Effect of Methylphenidate on Retention and Retrieval of Passive Avoidance Memory in Young and Aged Mice, Jundishapur J Health Sci. 2014 ; 6(4):e23465. doi: 10.5812/jjhs.23465. Background: Several studies showed that dopamine and norepinephrine improve retention and retrieval of memory. Methylphenidate is an enhancer of dopamine and norepinephrine in brain. 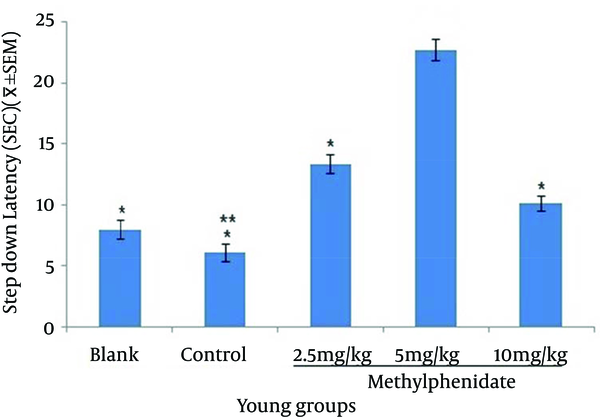 Objectives: In the present study, the effect of methylphenidate was evaluated on retention and retrieval of memory in young and aged mice using passive avoidance apparatus. Materials and Methods: Animals were divided into groups (n = 8) as follows: test groups received electric shock plus methylphenidate (2.5, 5 and 10mg kg-1, i. P.), control group received electric shock plus normal saline and blank group received only electric shock. In all groups, step-down latency for both retention and retrieval test of memory was measured. Methylphenidate was administered immediately after receiving electric shock in the retention test, but methylphenidate was administered 23.5 hours after receiving electric shock in the retrieval test. Results: The mean of step-down latency on day 4 was significantly higher compared to day 2 (P < 0.05) in all young and aged groups of mice. The best response was attained with 5 mg/kg of methylphenidate. 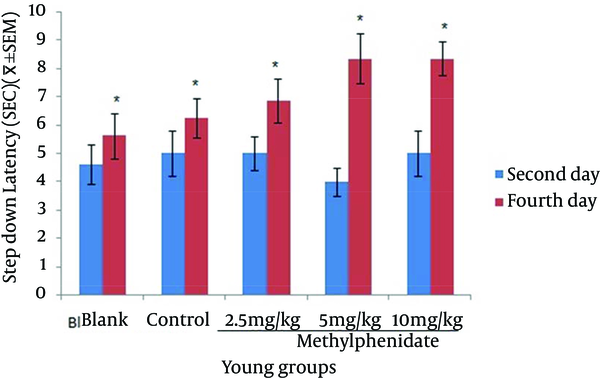 In memory retention test, the mean of step-down latency in young groups that received 2.5 and 5 mg/kg methylphenidate was significantly longer(P < 0.05) than aged groups. However, this difference was not significant in memory retrieval test. Conclusions: Methylphenidate may improve memory retention and retrieval. Memory is one of the most important functions of the brain. Memory is the process in which information is encoded, stored and retrieved (1). Certain neurotransmitters such as acetylcholine, noradrenaline, dopamine and serotonin are involved in memory formation (2-4). Methylphenidate is a stimulant drug related to amphetamine, which acts to increase the synaptic concentration of dopamine and noradrenaline by blocking their re-uptakes (5, 6). Methylphenidate has been used to treat attention-deficit/hyperactivity disorder (ADHD) in children. It is also used in depression, narcolepsy, brain injury, cancer, pain, cognitive disorders and immune deficiency (7, 8). 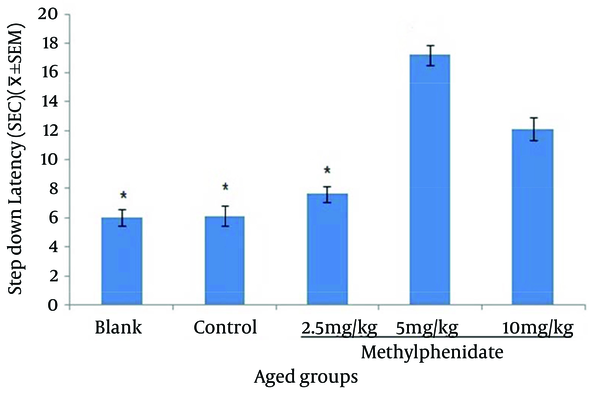 Methylphenidate is abused to enhance cognitive abilities by different groups of people. Some studies indicated that methylphenidate has cognitive enhancing properties, while others contradict this. For example, improvement in spatial working memory in healthy adults was reported by Mehta (9). Similar findings concerning spatial working memory improvement have been found by Elliott et al. (10). Schermer et al. reported that methylphenidate has no effect on concentration or sustained attention in healthy volunteers (11). Turner et al. reported no improvements in spatial span and spatial working, response inhibition (stop-signal) or sustained attention (rapid visual information processing) in their study population (12). The aim of this research was to investigate the effect of methylphenidate on retention and retrieval of memory in young and aged mice. Young (aged 3 months) and old (aged 15 months) male Wistar albino mice were used during the study. The animals were purchased from the animal house of Jundishapur University of Medical Sciences, Ahvaz, Iran. They were kept in a clean holding room on a 12-hour light and dark cycle with relative humidity of 45-55% and temperature of 23 ± 2°C. During the experimentation, all mice were fed with concentrated food pellets (Pars Khurakdam Shushtar, Iran) and tap water ad libitum (13). In this study, two groups of young adult and aged mice were used. Each group divided into five sub groups (n = 8) subsequently. The test groups received methylphenidate 2.5, 5 and 10 mg/kg. The Control group received normal saline (1 mL/100g) and the blank group was untreated. The step-down apparatus used to test passive avoidance, consisted of a box 25 × 25 × 20 cm in diameter with an electrifiable grid floor. There was a round plastic which could be enclosed by a 20-cm long hollow plastic cylinder with an inner diameter of 10 cm. On the first day, groups of four animals were given access to learning apparatus for three minutes to be familiarized with the new environment. On the second day, mice were individually placed on the platform inside the cylinder and after 10 seconds the cylinder was removed and the step-down latency was measured. Animals with latencies longer than 30 seconds were excluded from the study. On the third day, the same procedure was followed as the second day, except that a one-second foot shock (1 mA) was administered as soon as the animals left the platform with all four legs. Drugs were injected to animals immediately after foot shock, to study the effects on retention of memory. After 23.5 hours of shock, the same drug was injected to study the effect of retrieval of memory. On the fourth day, step-down latency of the mice was recorded. Each animal was used only once. All drugs were administered intraperitoneally (13). Results were expressed as means ± SEM. The data was analyzed using Student T-test and One-way ANOVA followed by LSD test. P < 0.05 was considered statistically significant. The mean of step-down latency on day four was higher compared to day two (P < 0.05) in retention and retrieval of memory in all young and aged groups of mice (Figures 1-4). 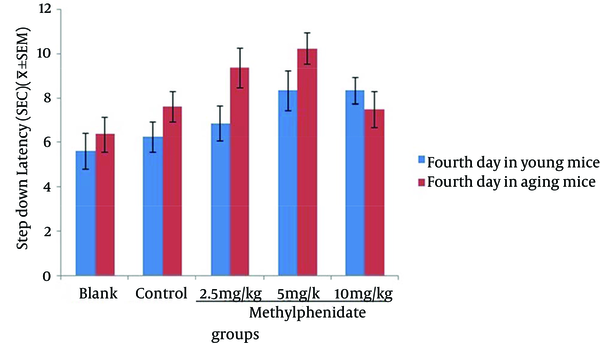 There was a significant increase (P < 0.05) in the mean of step-down latency on day four regarding retention of memory in young mice group,which received 5 mg/kg methylphenidate compared to other groups. 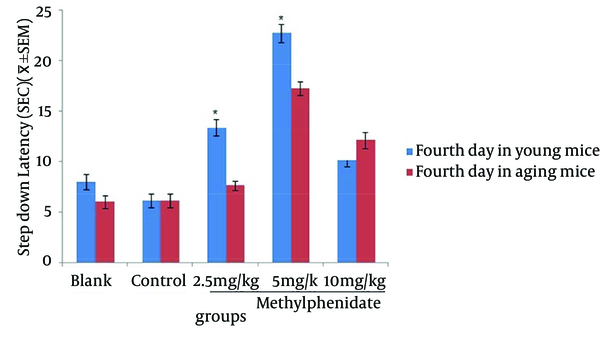 In addition, there was a significant increase (P < 0.05) in the mean of step-down latency of group that received 2.5 mg/kg methylphenidate compared to control group (Figure 5). 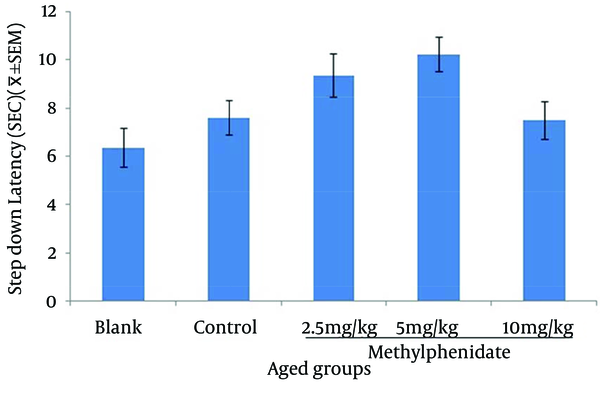 In memory retention test, the mean of step-down latency on day four of aged mice group that received 10 mg/kg methylphenidate,was higher (P < 0.05) than other groups (Figure 6). Comparing the mean of step-down latency on day four showed no significant difference in retrieval of memory in all young and aged mice groups (Figures 7and 8). In memory retention test, the mean of step-down latency on day four of young mice groups that received 2.5 and 5 mg/kg was higher (P < 0.05) than aged mice groups, the difference was not significant in memory retrieval test (Figures 9 and 10). Figure 1. Comparison of the Step-down Latency in Young Mice (n = 8) That Received (Blank) No Injection, (Control) Normal Saline (10 mL/kg), (Test) 2.5, 5 and 10 mg/kg Methylphenidate in Memory Retention Test in the Second and Fourth Days of Study. Figure 2. Comparison of the Step-down Latency in Aged Mice (n = 8) That Received (Blank) No Injection, (Control) Normal Saline (10 mL/kg), (Test) 2.5, 5 and 10 mg/kg Methylphenidate in Memory Retention Test in the Second and Fourth Days of Study. Figure 3. Comparison of the Step-down Latency in Young Mice (n = 8) That Received (Blank) No Injection, (Control) Normal Saline (10 mL/kg), (Test) 2.5, 5 and 10 mg/kg Methylphenidate in Memory RetrievalTest in the Second and Fourth Days of Study. Figure 4. Comparison of the Step-down Latency in Aged Mice (n = 8) That Received (Blank) No Injection, (Control) Normal Saline (10 mL/kg), (Test) 2.5, 5 and 10 mg/kg Methylphenidate in Memory Retrieval Test in the Second and Fourth Days of Study. Figure 5. 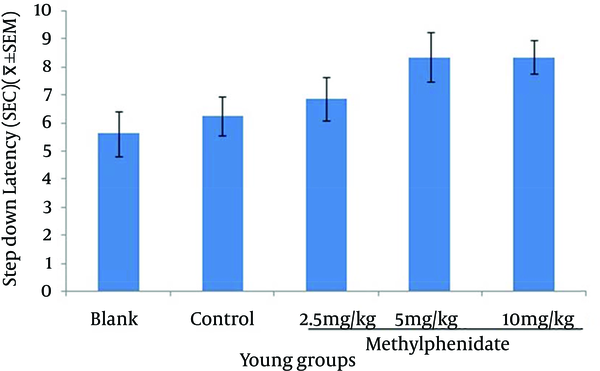 Comparison of the Step-down Latency in Young Mice (n = 8) That Received (Blank) No Injection, (Control) Normal Saline (10 mL/kg), (Test) 2.5, 5 and 10 mg/kg Methylphenidate in Memory Retention Test in Fourth Day of Study. Figure 6. Comparison of the Step-down Latency in Aged Mice (n = 8) That Received (Blank) No Injection, (Control) Normal Saline (10 mL/kg), (Test) 2.5, 5 and 10 mg/kg Methylphenidatein Memory Retention Test in Fourth Day of Study. Data was analyzed using One-way ANOVA followed by LSD test. *P < 0.05 as compared with the 5 mg/kg group. Figure 7. Comparison of the Step-down Latency in Young Mice (n = 8) That Received (Blank) No Injection, (Control) Normal Saline (10 mL/kg), (Test) 2.5, 5 and 10 mg/kg Methylphenidate in Memory Retrieval Test in Fourth Day of Study. No significant difference between the groups. Data was analyzed using One-way ANOVA followed by LSD test. Figure 8. Comparison of the Step-down Latency in Aged Mice (n = 8) That Received (Blank) No Injection, (Control) Normal Saline (10 mL/kg), (Test) 2.5, 5 and 10 mg/kg Methylphenidate in Memory Retrieval Testin Fourth Day of Study. Figure 9. 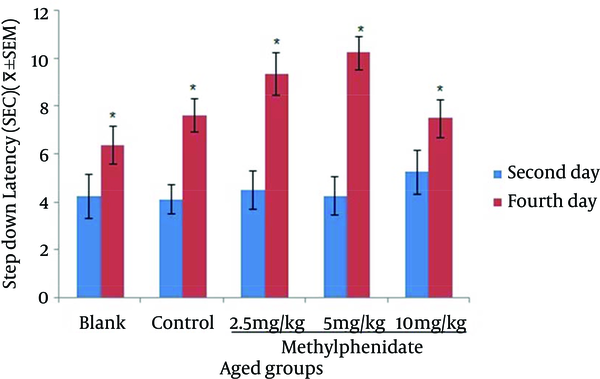 Comparison of the Step-down Latency in Young and Aged Mice (n = 8) That Received (Blank) No Injection, (Control) Normal Saline (10 mL/kg), (test) 2.5, 5 and 10 mg/kg Methylphenidate in Memory Retention Test in Fourth Day of Study. Significant difference between young and aged groups are shown as asterisk *. P < 0.05.Data was analyzed using Student's T-test and One-way ANOVA followed by LSD test. Figure 10. 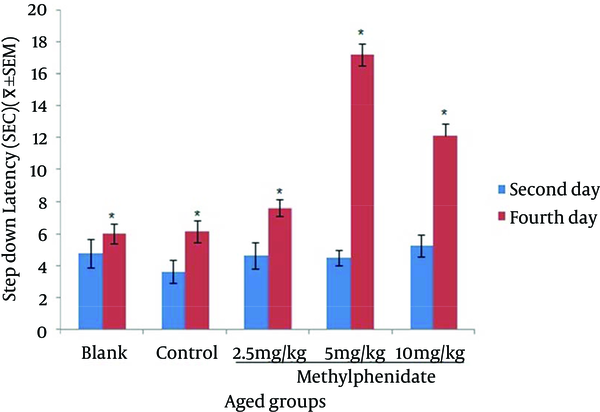 Comparison of the Step-down Latency in Young and Aged Mice (n = 8) That Received (Blank) No Injection, (Control) Normal Saline (10 mL/kg), (Test) 2.5, 5 and 10 mg/kg Methylphenidate in Memory Retrieval Test in Fourth Day of Study. There was no significant difference between young and aged groups. Data was analyzed using Student's T-test and One-way ANOVA followed by LSD test. Different nervous systems including cholinergic, dopaminergic, adrenergic, serotonergic and gabaergic are able to moderate memory function (14, 15). Studies have shown that inhibition of neurotransmitter in cholinergic system and stimulation of serotonergic system may impairmemory and learning. On the other hand, stimulation of dopaminergic and adrenergic systems improve memory and learning (2-4). Based on the mentioned documents, the effect of methylphenidate (indirect catecholamine agonists) on memory retention and retrieval was studied. The results showed that all doses of methylphenidate (2.5, 5, 10 mg/kg) improved memory retention and retrieval in young and old mice. The best effect on memory retention was observed at the dose of 5 mg/kg. 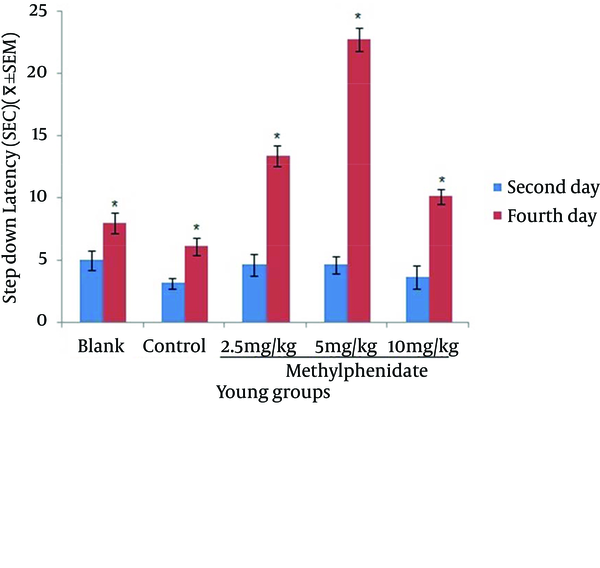 The results of this study showed that methylphenidate improved memory retention in young mice significantly at doses of 2.5 and 5 mg/kg, but not in old mice. No significant difference was detected between young and old mice on memory retrieval. Other studies showed that α-2 adrenoceptor agonists improved memory in neurological disorders such as Alzheimer disease (16). In another study,Yonkov et al. showed that stimulation of the dopaminergic and adrenergic systems by intraperitoneal injection of strychnine (20 mg/kg) and amphetamine 1 mg/kg enhanced the memory retention (17). Such finding is consistent with the results of the present study. In a study conducted by Lazarova-Bakarova et al. adrenergic system stimulation by clonidine increased memory retention, which confirms the findings of our study (18). In a study, 5 mg/kg dosage of norepinephrine enhanced memory, whereas high doses had no effect on memory. Norepinephrine may improve memory process through some indirectmechanisms, such as change in heart-vascular amends, because it does not appear to cross the blood-brain barrier (19). It has been shown that stimulation of the central dopaminergic system improves memory and learning, so that injecting dopaminergic agonists such as apomorphine and ergotamine into the hippocampus improves memory retrieval, which is consistent with our results (4). High doses of apomorphine and bromocriptine as dopaminergic receptor agonists reduce the memory retrieval. High doses of sulpiride diminish memory retrieval by blocking Pre-synaptic D2 receptor (20). The above results confirm our finding about memory retrieval.In conclusion, methylphenidate may improve memory retention and retrieval probably due to releasing norepinephrine and dopamine in CNS and preventing re-uptake of these neurotransmitters. However, more studies are required to ascertainthe exact role of methylphenidate in retention and retrieval of memory. This research was supported by a grant (PRC-81) from the physiology research center of Ahvaz Jundishapur University of Medical Sciences, Ahvaz, Iran.